Hundreds of people braved the rain, wind and cold Saturday to take part in a nationwide series of rallies in support of people living with chronic pain and illness. The “Don’t Punish Pain” rallies were organized by a grassroots group on Facebook and held mostly at state capitols in 47 states. The primary goal of the rallies is to get the Centers for Disease Control and Prevention to change its opioid prescribing guidelines, which have caused many doctors to stop treating patients with opioid medication or to drastically lower their doses. Although attendance was sparse in some locations, a dozen or more people gathered in Baton Rouge, Dallas, Little Rock, Annapolis and several other cities. 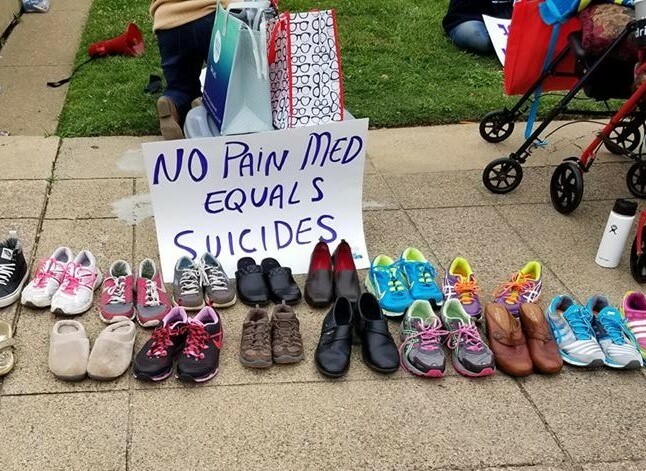 Some protestors brought an empty pair of shoes to represent people who were too ill to attend, those who have died due to poorly treated pain, and some who have committed suicide. While the turnout may have been disappointing to some, the rallies were successful in attracting local media attention – shining a rare spotlight on the plight of pain patients and how many are suffering in an age of hysteria over opioid medication and the overdose crisis. "We have gone so much to the other side that we are forgetting that there are voices of pain that need to be heard," Carlene Hansen told KIVI-TV in Boise, Idaho. "I've been on medications for 5-7 years and always take it as prescribed." "I think that a responsible doctor is going to do the right thing and prescribe the right medications for the right individual," Michele Thomas told the News Tribune in Jefferson City, Missouri. "Where I have a problem is when the government comes in and tells the doctor that they cannot prescribe what the doctor feels is the best medication." The Don’t Punish Pain rallies were organized in the last few months on social media without support or funding from patient advocacy groups or pharmaceutical companies. Since the CDC released its opioid guidelines in 2016, many patients say the quality of their medical care has gone downhill. In a PNN survey of over 3,100 patients on the first anniversary of the guidelines, 84 percent said their pain and quality of life had gotten worse. Over 40 percent said they had considered suicide and 11 percent said they had obtained opioids on the black market for pain relief. CDC researchers recently admitted that they significantly overestimated the number of Americans that have died from overdoses involving opioid medication. A CDC report released last month found that most drug deaths are actually caused by illicit fentanyl, heroin, cocaine and other drugs obtained on the black market.